Team Ursa's primary mission is to provide engineering support for the development or improvement of reference designs maintained by the Mavericks Civilian Space Foundation. All of these designs revolve around providing better classroom and edcational access sub-orbital space. Usually Ursa focuses on a specific component of a reference launch vehilce, as required by the Mavericks. Read on below for the latest examples of such work. To prove the team's designs Ursa often puts together research vehicles on which to test the prototype reference designs. These vehicles are not reference designs in their own right, but represent significant work and effort on behalf of the team members. As an additional goal of the team, there are plans laid out to eventually reach space with one of these research vehicles. To achieve this, Team Ursa will be using many of the reference designs we have helped to create, as well as others generated by separate teams and the Mavericks themselves. To better understand these future plans please take a look at the roadmap page. Our partner in this development, Mavericks, recently dispatched Team Ursa on the specific mission to develop, prove, and record a reference design for a coupling system between rocket airframe components, or what is called a separation ring, and for a PPU, otherwise known as a Payload Packaging Unit. As a result, many of the team's recent designs revolve around this request for a more user-friendly and modular design of launch vehicle. The need for these technologies has arisen during launches in the past, organizations and businesses would often prepare their experiments for flight without any knowledge of how to protect the experiment from the ride to space. The results were unsatisfactory and inefficient. As a result, Team Ursa has developed the PPU reference design so that the process of packaging a payload for flight into space is clear, easy to understand, straightforward, and robust. The form factor of the experiment simply has to be compatible with the requirements of the PPU. Each flight will have multiple payloads on board, and each payload will be in a PPU. When the day to launch comes all that must be done is lock each PPU together with the separation rings, creating the vehicle airframe without any headaches or worries! Essentially, each PPU is a short section of rocket airframe with Separation Rings at each end. Several PPU's can be stacked and locked together to form the complete airframe. Additional ease is created by the modular design since the PPU's can accept standard CubeSat payloads. A school or researcher can choose to either build the entire PPU or can choose to simply bring the CubeSat to the launch site for insertion into a pre-built PPU shell. The PPU is the future of sending experiments and other objects into sub-orbital space. 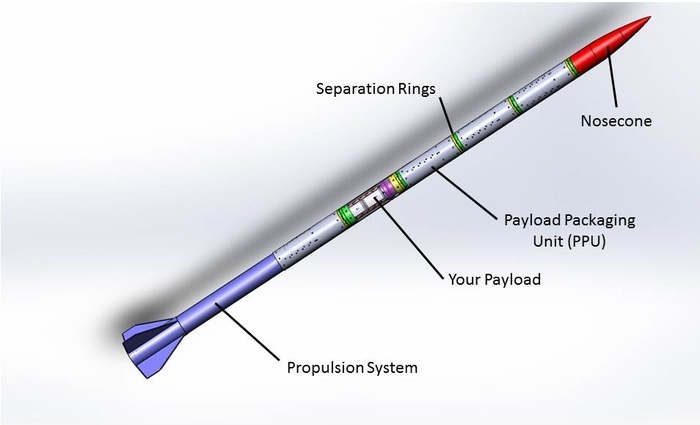 The Separation Rings will not only make attaching a PPU easy, but will allow each of the PPU’s to separate from the airframe at different points after apogee so that they can perform independent science. Ursa 2.1 was the first research vehicle to test these separation ring and PPU reference designs under the rigors of takeoff and in-flight separation. The PPU is the building block of a modular launch vehicle. Each PPU can attach to a neighbor to form a continuous piece of airframe. A specialized PPU can be made for attitude control, and partial modified PPUs can be used for the nosecone and booster motor recovery. Best of all, each PPU accepts two 1.5U CubeSat payloads. One of these CubeSats is referred to as the FMU (Flight Management Unit), and will be used to house all the avionics for triggering separation and recovery of that PPU. The second 1.5 CubeSat is totally available for payload use and is called the PMU (Payload Management Unit). If a school or institution is not capable of building an entire PPU then only the 1.5 CubeSat PMU need be fabricated. The institution carrying out the the launch can then slide this into an existing PPU at the launch pad. Each PPU has its own recovery system that allows it to return to earth safely. The most common scenario will be that all the PPUs separate from eachother at apogee. Includes all the necessary GNC (Guidance Navigation and Control) electronics necessary for normal function of the PPU. In the photo above team member Ben holds two PPUs held together in the middle by a separation ring. The separation rings are the heart of the new modular method of constructing the launch vehicles, and are used to connect adjacent PPU's. Without the separation rings it would be impossible to link the PPU's together. Shown above are two halves of the separation rings coupled. The separation event will be triggered by a black powder charge, making the use of these rings possible for individuals unlicensed with explosives as you might find at a school or university. Each PPU requires a Flight Management Unit (FMU) to operate properly. A FMU is a 1.5U CubeSat that contains all the electronics necessary to fire the charges in the separation rings on the PPU as well as eject the recovery systems from the PPU. Ursa has been experimenting with 3D printing for the body of the FMUs. Shown below are a FMU (left) and a PMU (right). FMU's flown so far have all used simple commercial flight computers, but team member Ian is working on a more advanced and custom GNC board which will be used in future versions. Perhaps this will become it's own reference design in the future. A PPU contains both a FMU and a PMU. The PMU is completely available for payload space, providing 1.5U of standard CubeSat space, and 2 kg of payload mass. A school could 3D print their own PMU and then bring it to the launch site for flight. The Ursa 2.1 will eventually be the 2nd stage for our sub-orbital space researchvehicle, but first the team is launching it without a booster motor in order to test the separataion rings and our low altitude recovery systems. Read more about the progression of launch vehicles here. The Ursa 2.1 is a research vehicle, and is not itself a reference design, however it uses many reference design components. For example, the Ursa 2.1 is powered by a standard P motor reference design by the Mavericks. It also uses the PPU and SR reference designs mentioned above. An Ursa 2.1 research vehicle can carry 3 full PPU’s, plus the nosecone payload, a special PPU built for containing a stabilization module called the ACU (Attitude Control Unit), and another specialized PPU for recoverin the motor called the PRU (Propulsion Recovery Unit). These allow each of the modules making up the launch vehicle to easily connect, think Legos! The Ursa 2.1 will use a proven and custom made solid propellant motor which is already a Mavericks reference design, designated the "Mavericks standard P"
The Ursa 1.0 is now a legacy resarch vehicle, Ursa designed, built, flew, and learned from it. Many aspects of the Ursa 1.0 are incorporated into the design of the Ursa 2.1, and therefore live on! Check out the multimedia page for more information! Watch a static test here!